TAC-PAC® offers private labels for the commercial reloader who wants to move their business to the next level. TAC-PAC® can create customized labels built to your company’s specifications. Utilizing the links on the page below, the Die Lines and Printer's Specifications can take your business to levels of exposure that previously only major ammunition manufacturers could enjoy. 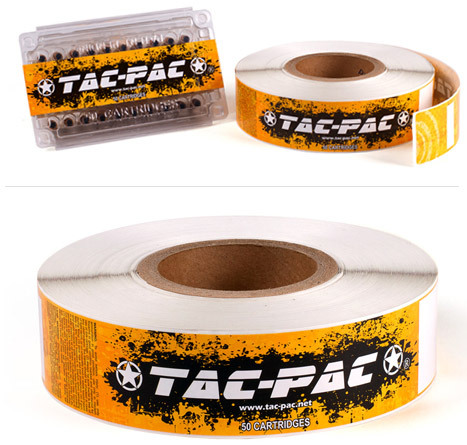 TAC-PAC® can help you customize the look of your company, your ammunition and your future. We have the ability to produce graphics using up to four colors, still allowing you space to individualize each label for caliber, grain, and SKU specifications in the blank areas provided. Please contact TAC-PAC® Customer Service with your customized Label request and we’ll provide you with pricing and availability to take your business to the next level and beyond!